April 5, 1936: Here is another publication of the recent photo taken of that new MGM contract player, Judy Garland, and Marlena Dietrich’s daughter. 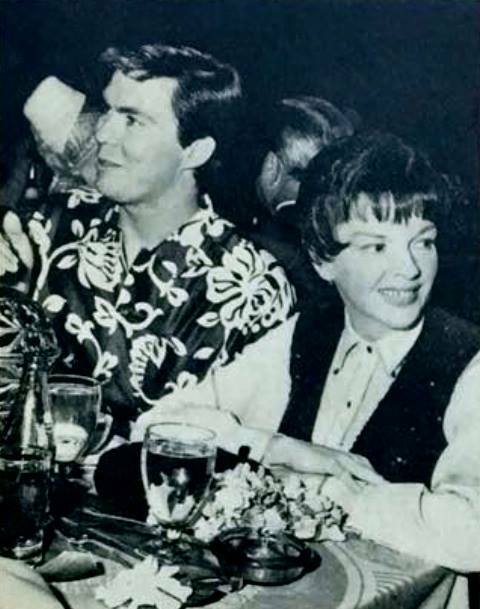 April 5, 1942: Here’s another photo of Judy at Don DeFore’s wedding which took place on February 14th. Judy served as Matron of Honor. The wedding took place at the Chapman Park Chapel in Los Angeles, followed by a wedding breakfast at the Brown Derby. 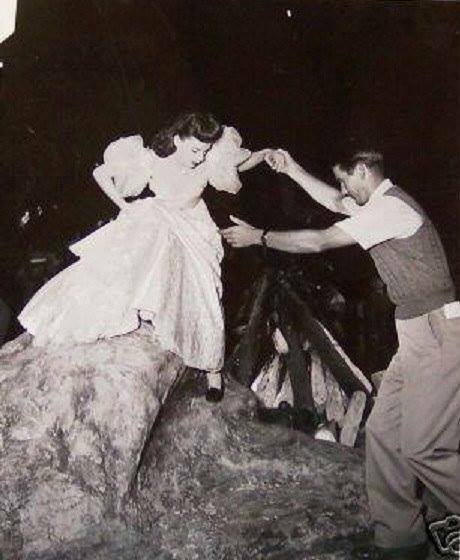 April 5, 1943: Filming continued on Girl Crazy specifically on the “Exterior Indian Rock” set. 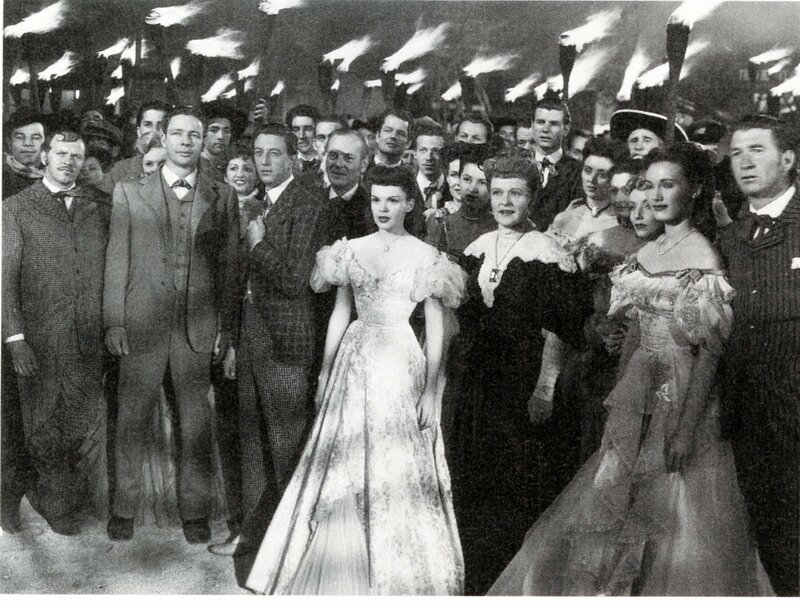 Time called: 10:20 a.m.; dismissed: 5:55 p.m.
April 5, 1944: Night shooting for Meet Me In St. Louis on the “Exterior Smith House and Street” on MGM’s Backlot #3. Time called: 7 p.m.; ready at 7:35 p.m.; dismissed: 12:00 midnight. 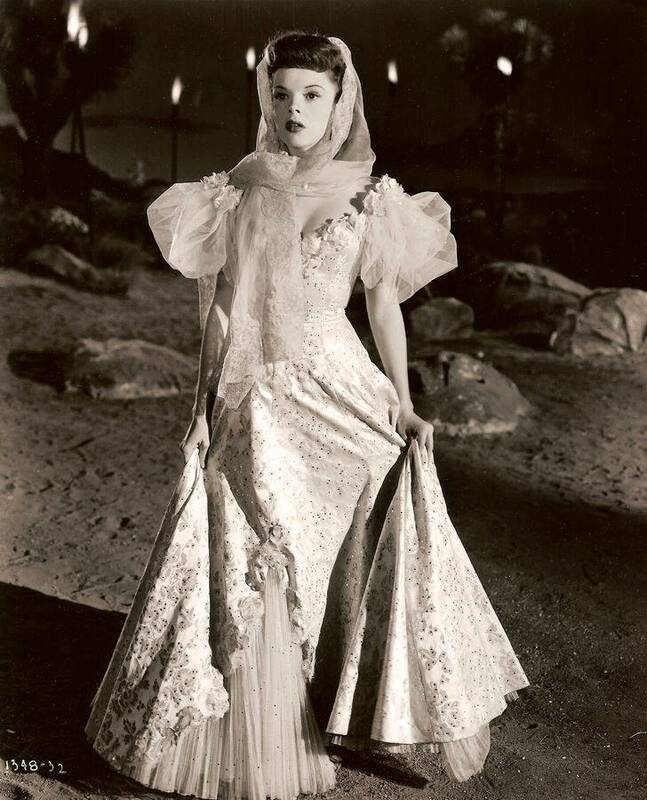 It’s interesting to note that a year later on this date Judy was back on MGM’s Backlot #3 for another nighttime shoot, this time for The Harvey Girls (see below). 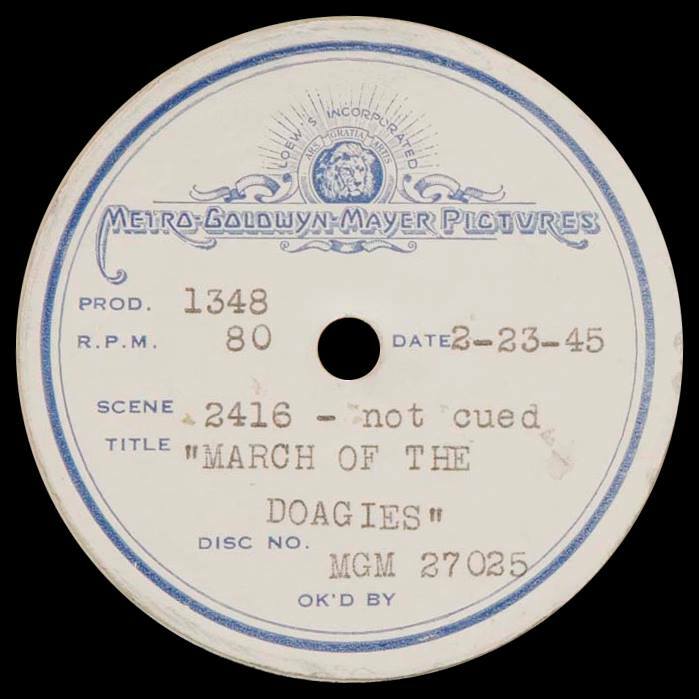 This was a nighttime shoot, for the “March of the Doagies” sequence which was cut from the film. Time called: 7:30 p.m.; arrived: 7:50 p.m.; dismissed: 2:30 a.m. 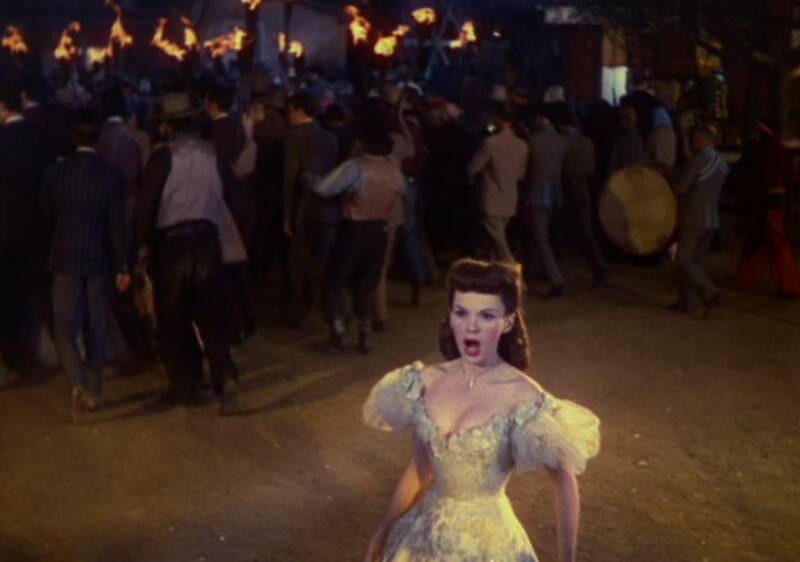 Some of the photos above were taken on an MGM soundstage and not on MGM’s Western Street, but are included here as they’re part of the extensive “March of the Doagies” number and reprise. Playback disc images from the Rick Smith Collection. Thanks, Rick! 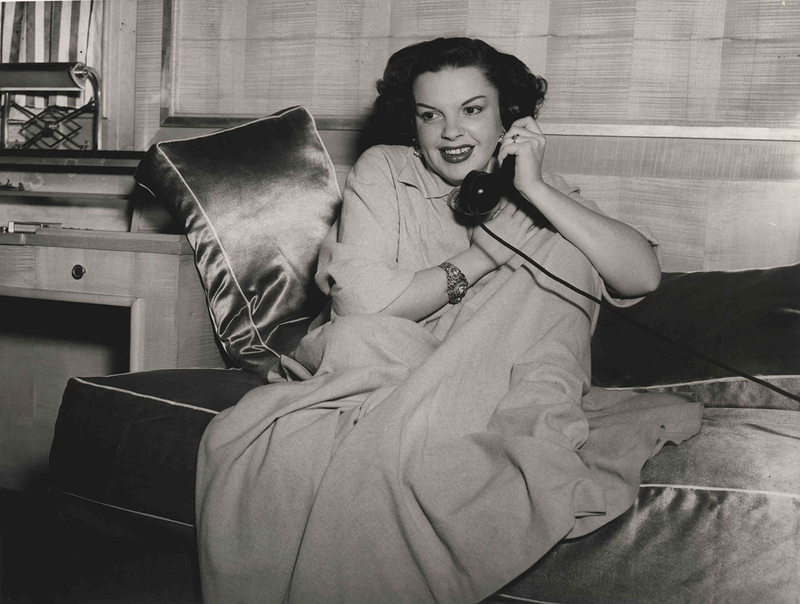 April 5, 1951: This photo of Judy on the Ile de France is dated on this date, which is the day that she arrived in London after sailing on the ship to England, meaning the photo was taken prior by at least a day or two. Judy was embarking on a new phase in her life and career. She was set to open a new stage show at the London Palladium on April 9th. The show was a huge success and began her legendary Concert Years. 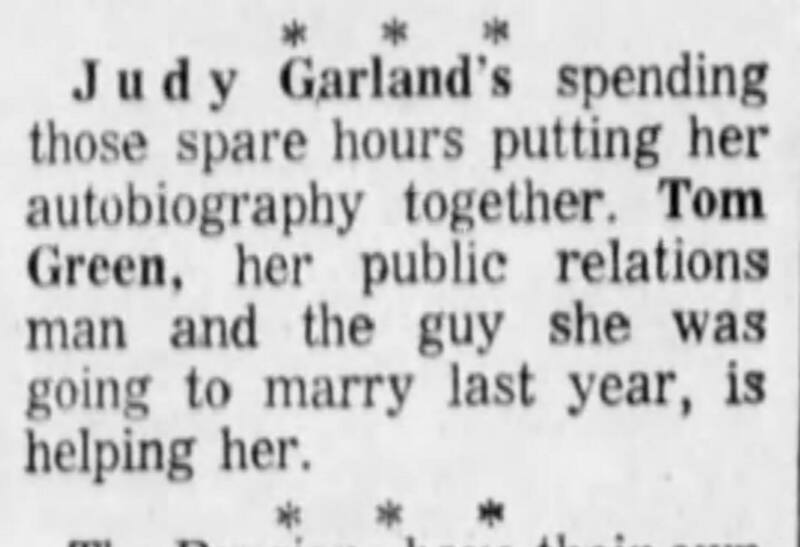 April 5, 1952: Here’s an article that relays a story of Judy’s response to seeing her photo in the papers. 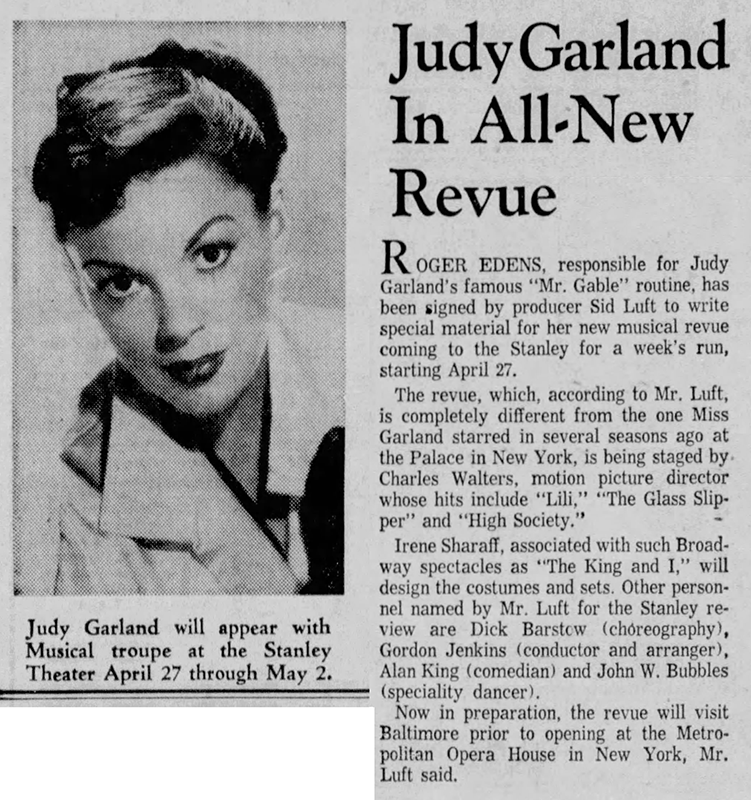 April 5, 1953: Judy’s upcoming appearance at the Bluegrass Festival in Lexington, Kentucky, was noted in this article. Judy gave her concert on April 29. 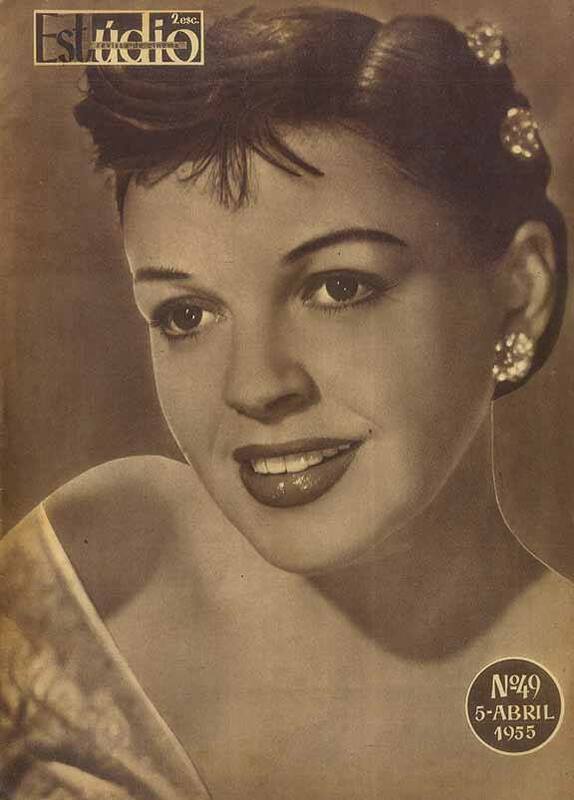 April 5, 1955: This lovely A Star Is Born promotional photo was featured on the cover of “Estúdio” magazine. Check out The Judy Room’s Extended Spotlight on A Star Is Born here. 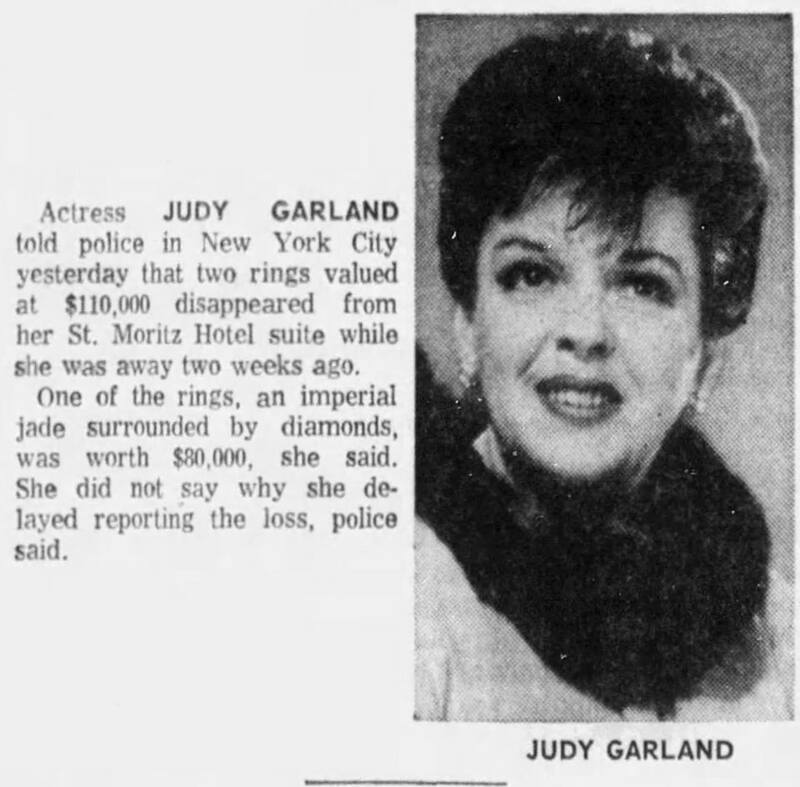 April 5, 1956: This article doesn’t have much to say about Judy aside from some gossip that she might go to Broadway to do a musical comedy, but the caricature is great! 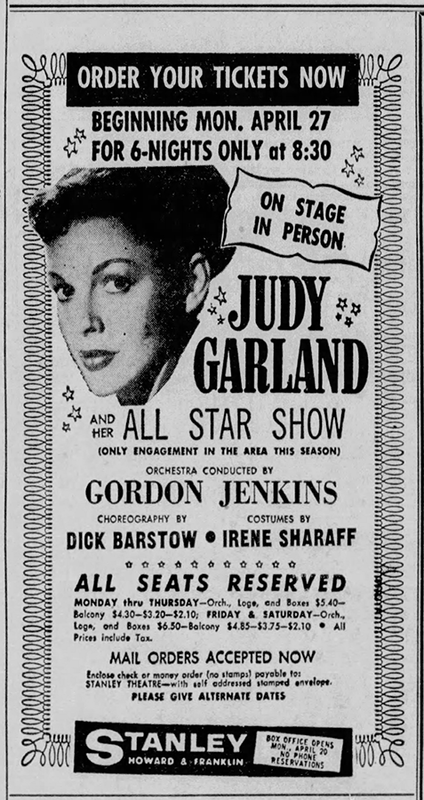 April 5, 1959: “The Baltimore Sun” published this article and ad, in anticipation of Judy’s show coming to the Stanley Theatre in Baltimore. April 5, 1963: A Star Is Born was shown on local TV in Vancouver, British Columbia, Canada. April 5, 1965: Judy appeared on the Academy Awards broadcast from Los Angeles, California, on ABC-TV. She was introduced by Gene Kelly and sang a medley of Cole Porter songs in tribute to the songwriter, arranged by Roger Edens. 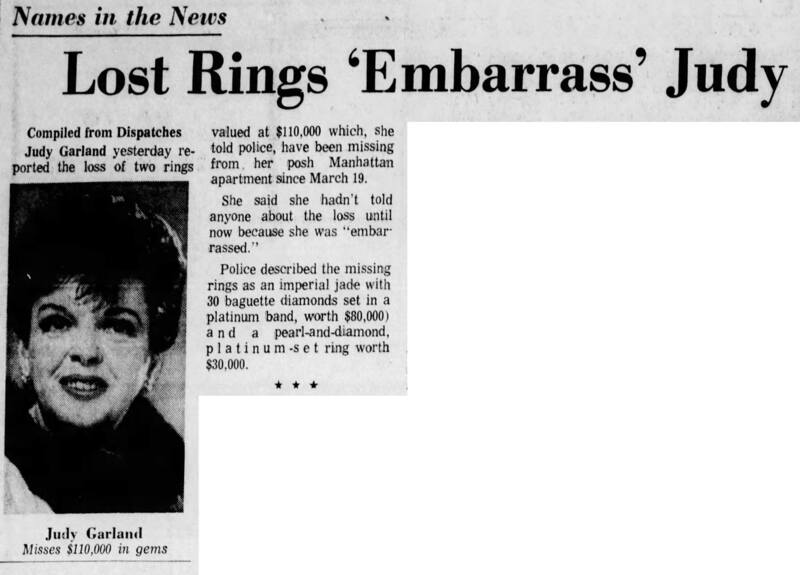 Judy had called the police (the West 54th Street police station, near the St. Moritz where she was staying) on April 3, 1968, and reported that two rings had vanished on March 19. Judy had forgotten that Green pawned the rings to pay for her hospital and hotel bills. In November of 1968, Green reported his expenditures as being $58,815.62, which was $10k more than this April 5 report. That report included a copy of a legal summons, instituting a suit by Green, against Judy, for the monies owed him. The suit was never filed. Photos: Newspaper clippings from April 4 & 5, 1968; Judy and Tom Green in 1967. Congratulations on the completion of this project! What an accomplishment! Thanks to your motivation and commitment, we now have a spectacular follow-up to Scott Schechter’s 2002 book to enjoy. You should feel very proud and we are very grateful – please give yourself a huge pat on the back! 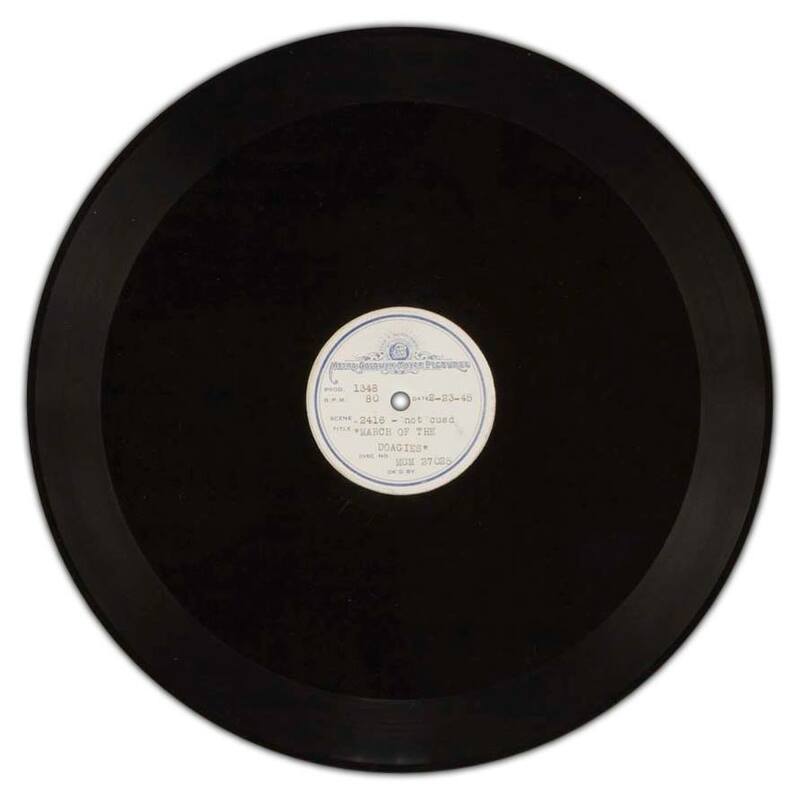 A while ago, you kindly agreed to go back and post the underscoring session daily music reports for Judy’s movies. 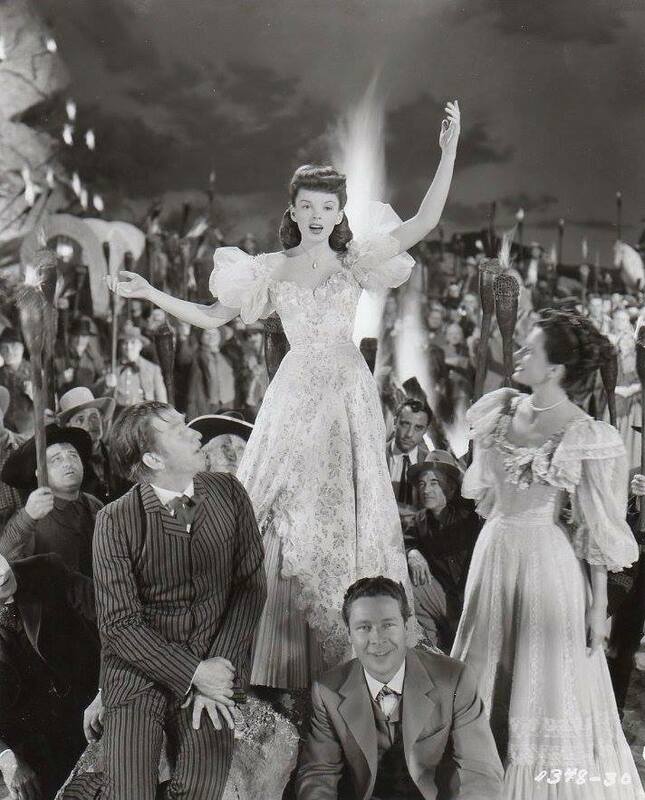 If you could still do that (including those pertaining to her “guest” movies such as Ziegfeld Follies and Clouds), that would be the icing on the cake! Many thanks in advance and again, congratulations! You’re a doll! Thank you for knowing that this completes all 365 days! You stole my thunder a little bit (I’m teasing) – I have a post going out tomorrow explaining that we’re at the one year mark and that an entry for every day of the year is now available. No, no more daily posts because they’re all posted! I am, indeed, now going to be able to go back and add/update posts including the extra Daily Music Reports (there are a ton of them). The first several days of the project (April 6th through around the 10th) were sparse and I will be expanding those entries to be as detailed as the rest of them. I’m also (I have a “to do” list) going go through and add major home media release dates that aren’t already noted. Lots to do but now I’m not on a daily deadline and can relax and take some time off from the blog. Congrats on this spectacular series! I’ve learned so much from it . . . and have been wonderfully entertained along the way! Now I’m crossing my fingers that you’ll get around to that eagerly anticipated “Bullies and Haters and Trolls – Oh My!” in the “Wars” series. Lawrence Schulman said the best was yet to come! Wow, this is an awesome achievement! One whole year! I’m blown away by the magnitude of what you’ve given us, Mr. Brogan! I joind this list somewhere in the middle and look very much forward to the enhanced postings that I missed. I know a certain person with the initials SS is smiling down on you this day……. God bless you and thanks again for your dedication, your work and your commitment to quality. I get SO MUCH pleasure from your site! Scott, you’re not going to believe this, but I always thought you’d continue to post every day of the year, but tweak things around with different events pictures that may have not made a date last year. Pretty silly. Of course, now that you’re done, you DO deserve a huge pat on the back. Always fun to peruse. March of the Doagies: I love this number, and always watch THG with it back in the movie. However….that reprise looks mighty corny, and since I have no idea why they are back BEFORE the fire, it just plays badly. This was rightfully cut. But the main number itself should’ve stayed in the film if only for the sake of the narrative. P.S. : Be sure and let us know the release date for the “Summer Stock” Blu Ray release! !